Gladys Vollberg Service Details - East Liverpool, Ohio | Dawson Funeral Home, Inc.
Columbus, Ohio - Gladys C. Volk Vollberg, 94, of Columbus, formerly of East Liverpool, passed away peacefully Monday, October 1, 2018 at the Kobacker House in Columbus while surrounded by her loving family. Born in Pittsburgh, Pennsylvania on May 26, 1924, she was a daughter of the late Alexander and Theresa Lang Volk. In addition to her parents, she was preceded in death by her loving husband, Edward L. Vollberg, sons, Edward G. Vollberg and Thomas G. Vollberg, granddaughter, Tracy Vollberg, grandson, Edward Phillip Vollberg and granddaughter, Nikki Rai Vollberg, three brothers, Larry Volk, Raymond Miller and James Miller, and a sister, Nancy Kunold. 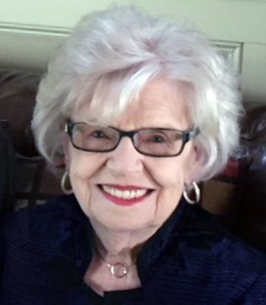 Beloved and admired by her family and many friends, Gladys lived her life in Pittsburgh, then East Liverpool in 1953 until ten years ago when she moved to Powell, Ohio to live with her daughter and son-in-law, Carol and Paul Gydosh. She was a devoted member of St. Aloysius Catholic and strong in her Catholic faith. She was active in the Ladies Auxiliary of the Knights of Columbus and the Alter and Rosary Society at the parish. Gladys always had a constant smile, spoke positively of everyone and always said “thank you.” She loved entertaining family and friends and traveling at a moment’s notice to Las Vegas, South Florida, and even Italy on her 80th birthday. She and her husband founded Tri State Glass in 1970 in East Liverpool where they worked together for many years. Survivors include a daughter, Carol A. Gydosh and her husband, Paul of Powell, Ohio; daughter-in-law, Diane Vollberg, East Liverpool; nine grandchildren: Thomas (Tammy) Vollberg, Jodi (Paul) Shaw, Lori (Randy) Ball, Richard (Christie) Wolfe, James (Tammie) Wolfe, Troy (Autumn) Vollberg, Travis (Angela) Vollberg, Paige (Steve) Butters, Carly (Andrew) Keatts; 26 great-grandchildren and many nieces, nephews, great-nieces and great-nephews. A sister, Alice Schaller survives as well. Friends may visit the family at the Dawson Funeral Home in East Liverpool on Friday from 4 to 8 p.m. Father Scott Kopp of Holy Trinity Parish will officiate a Mass of Christian Burial at the church at 1:00 p.m. Saturday. Immediately following the service, family and friends will gather at the Dawson Family Center for a time of further fellowship and remembrance. To send flowers to the family of Gladys Vollberg, please visit our Heartfelt Sympathies Store. Carol and Family; My deepest sympathy to you and your family for the loss of your Mother. God has gained an angel and she has left this earthly world to watch over you each day. May the wonderful memories help you in days to come. A life well-lived and well-loved, and still it seems Aunt Gladys is gone too soon. Our condolences at her moving on from this earth, and God's grace and peace to you as you deal with her absence. Embrace her memories, as we will. Our family always enjoyed the spectacle of seeing the "sisters" together her in eastern PA. What fun and laughter, and certainly great memories as we recall the many times the "western" folks came to see our daughter's dance recital and just have a hoot with Nana Schaller (Gladys' sister, Alice). Hugs, kisses, and many prayers from us. My prayers in the passing of your loved one. Remember her from days of past.